Today I have pictures from the campus of EHWA Women's University for you. 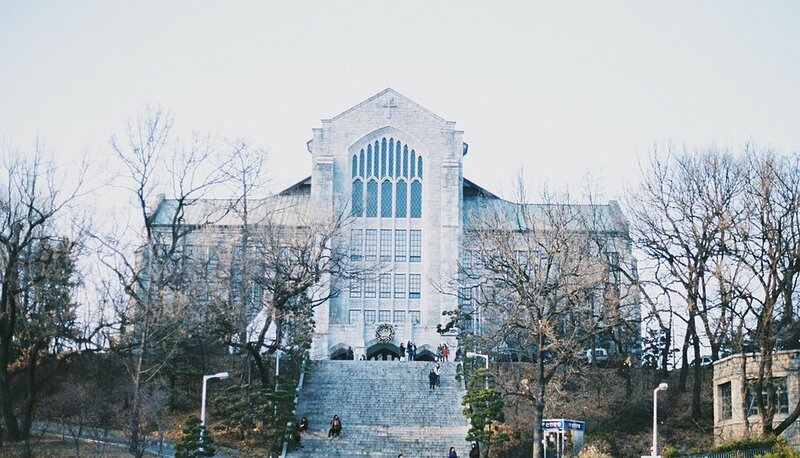 This is a very good university in Seoul. My sister visits her for a year. Getting used to: a pure women's university. But it is really great in the student quarter (with two other universities with men next to it) with many interesting shops and a well-placed campus. Once again here nature, history and modernity are merged. Some campus buildings really look like they are more in England than in the capital of Korea. And some are as modern again as the picture of metal plates proves. The large auditorium building is actually a park hill with a huge staircase in the middle which leads down and from which left and right instead of earth are at one time glass fronts. I think the university is really great. You can also view them as a tourist. I was not the only one with a camera. One drawback: The campus is absolutely hilly and full of many, steep stairs. Without condition one is lost here. We went to the library to deliver some books. It was, of course, with the tallest building and a felt eternity gone by stairs. Still, it was a great afternoon on campus and the sun was setting beautifully.